Remington 7mm Ultra Magnum ammunition was designed as a rifle round in 2001 by Remington arms. The 7mm Rem Ultra Mag cartridge was at upgrade on the existing 7mm Remington Magnum. The Ultra Magnum delivers 25 % more energy than the standard Remington Magnum. The 7mm Remington Ultra Magnum is the smallest of the Ultra Magnum calibers, but is still an extremely fast round. The cartridge is capable of reaching over 3,000 feet per second with a 170 grain bullet and 3,555 foot-pounds of energy into a target. These rounds are an interesting choice for hand-loaders. The round and large case size give the round a lot of potential for customization. That being said the round is not designed for novice handloaders and many reloading guides will not carry information for the cartridge. 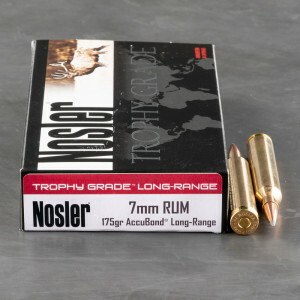 Novice handloaders should rely on factory ammunition for the sake of safety and reliability; the round can very easily be overloaded and cause damage to the rifle and harm the shooter. This round shoots well through a Rifle , tight groups at all ranges . I has a lot of power at long range past 500 yards , 700 it's still shoots well . This is a 1000 yard Rifle Easy . Great accuracy and I'm happy to have finally found ammo for my RUM! This bullet is awesome! They shoot 1/2 inch groups at 100 yards. The only thing is I can't find them any where.